Kweichow Moutai Co Ltd, China's signature high-end spirit maker, reported slower profit growth in the third quarter, as lower deliveries and an overall market slowdown had dampened growth. Sales totaled 18.85 billion yuan (2.71 billion U.S. dollars) in the third quarter, up 3.82 percent year-on-year, and net profit reached 8.97 billion yuan (1.29 billion U.S. dollars) in the period, edging up 2.71 percent year-on-year, according to the company's latest earnings report. 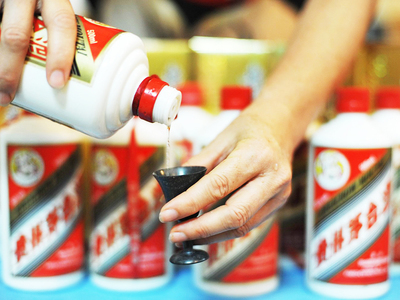 The results marked Moutai's slowest quarterly growth since 2012. In the first three quarters of the year, the company achieved sales revenue of 52.24 billion yuan (7.51 billion U.S. dollars), jumping 23.07 percent year-on-year. The company's net profit reached 24.73 billion yuan (3.55 billion U.S. dollars), expanding 23.77 percent on last year. Shanghai-listed Moutai dropped to 549.09 yuan (78.92 U.S. dollars) per share to close 10 percent lower in Monday trading, hitting the daily limit. The company's valuation now stands at 690 billion yuan (99.17 billion U.S. dollars). Earlier this year, Moutai, a distiller from Maotai in Southwest China's Guizhou province, became the first consumer stock to achieve a market value of over 1 trillion yuan (143.73 billion U.S. dollars) during trading. On Monday, the Shanghai and Shenzhen stock exchanges both saw lukewarm performances, while the liquor sector saw a sharp decline. Moutai rivals Wuliangye Yibin Co Ltd and Gujing Group, among others, saw their shares slump by the daily limit of 10 percent. Investment bank BOC International (China) Co Ltd said that from 2019 to 2020, the overall growth rate of the liquor sector in China will slow, as the sector's cycle returns from the significant growth achieved in 2017 and 2018. Yet, market demand remains robust, and the ongoing consumption upgrade trend will not change, meaning it is unlikely that Moutai's prices will plunge in the near future, BOC said. "In September, Moutai liquor deliveries were lower than expected, resulting in slower performance growth, indicating that the company tends to keep its product prices stable," the bank said. "The slower sales performance could lead to concern among investors. Moutai's value has dropped to a relatively low level, and after a period of pessimism, there will likely emerge some good opportunities for new investments," it said. Li Baofang, chairman of Moutai, said earlier the company predicts whole-year sales revenue of 90 billion yuan (12.94 billion U.S. dollars) for 2018. Next year, it expects to achieve sales revenue of 100 billion yuan (14.37 billion U.S. dollars). A 500 milliliter bottle of Moutai's classic Feitian 53 percent liquor that left the factory in 2015 now carries a price tag of 2,299 yuan (330.44 U.S. dollars) on online shopping platform JD. In July, the same product retailed for 2,388 yuan (343.23 U.S. dollars).